LONDON: British Prime Minister Theresa May has said the UK should not hope for a "better deal" from the EU if MPs reject her Brexit agreement. She told a BBC phone-in that there would be just "more division and uncertainty" if Parliament voted against the agreement next month. But she declined to say whether the UK would be better off outside the EU, saying only it would be "different". A summit of EU leaders to sign off the deal will go ahead on Sunday despite "unresolved" issues over Gibraltar. Its prime minister Pedro Sanchez has said he won't decide whether to attend Sunday's summit until these are provided. on its own at this stage. Meanwhile, the leader of the DUP, Arlene Foster, has said she will "look again" at her party's deal with the Conservatives if Mrs May's Brexit bill passes through parliament. May told the Emma Barnett Show that her job was to persuade MPs to back her but also to "explain" the merits of the deal to the public. "I believe if we were to go back to the European Union and say: Well people didn't like that deal, can we have another one? ... I don't think they're going to come to us and say: We'll give you a better deal." 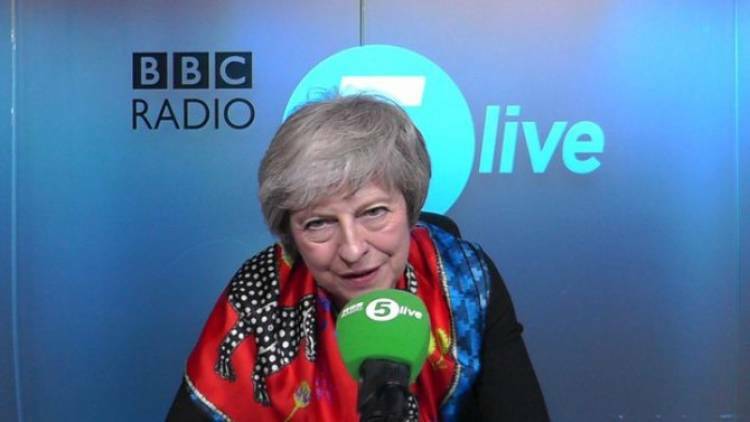 Asked what was a more likely outcome in such an event -- a no-deal exit or the UK remaining in the EU -- she said "from my point of view, personally, there is no question of 'no Brexit' because the government needs to deliver on what people voted on in the referendum in 2016". Asked by a caller called Michael if the UK would be better off outside the EU under her deal than staying in, she said that as someone who voted to Remain, she had never said the "sky would fall in" if Brexit happens. "I think we will be better off in a situation which we'll have outside the European Union, where we have control of all those things, and are able to trade around the rest of the world," she said. She added: "You say: Are we better off?... actually it's a different sort of environment, and a different approach that we'll be taking to things." The document, known as the "political declaration", is not legally-binding but will be the starting point for negotiations on co-operation after the UK leaves. It has been heavily criticised by many MPs for lacking detail.